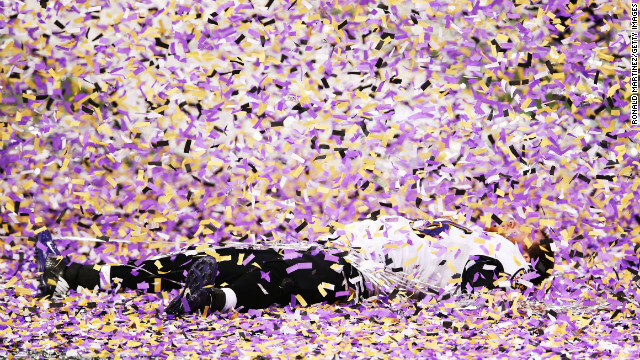 Morgan Cox of the Baltimore Ravens lies on the field while celebrating after defeating the San Francisco 49ers 34-31 in Super Bowl XLVII at the Mercedes-Benz Superdome on Sunday, February 3, in New Orleans, Louisiana. 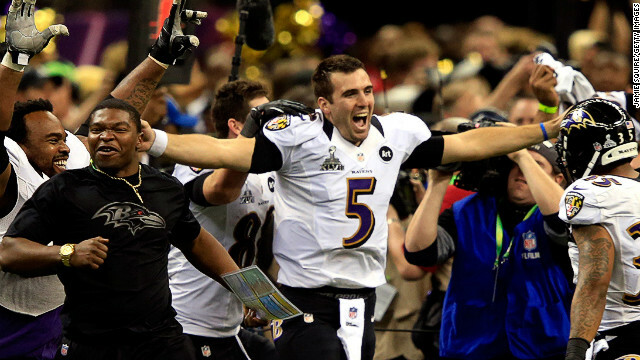 Super bowl MVP Joe Flacco of the Baltimore Ravens celebreates with his teammates. 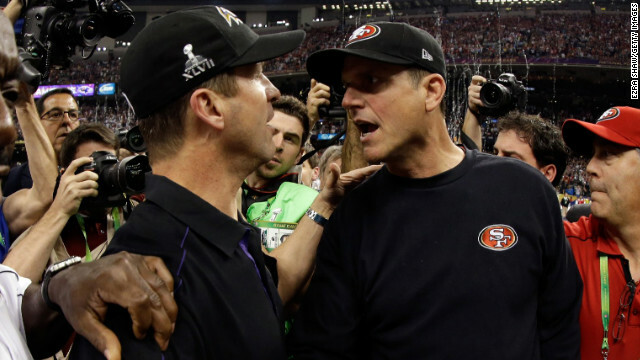 Head coach John Harbaugh of the Baltimore Ravens, left, shakes hands with his brother, head coach Jim Harbaugh of the San Francisco 49ers, after winning Super Bowl XLVII in a close contest. 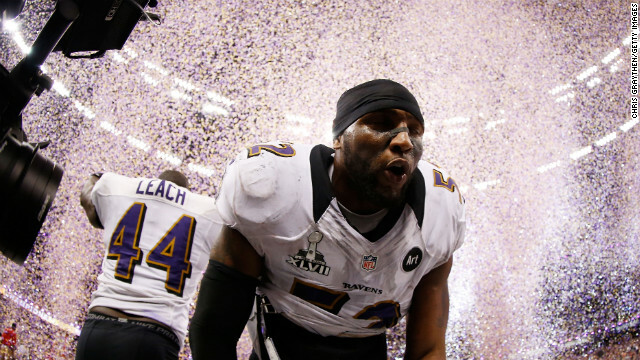 Retiring linebacker Ray Lewis of the Baltimore Ravens celebrates as confetti falls after the game. 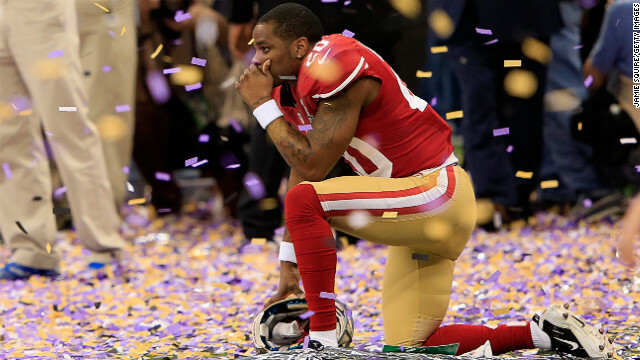 Perrish Cox of the San Francisco 49ers kneels on the sideline after his team lost the Super Bowl to the Baltimore Ravens. 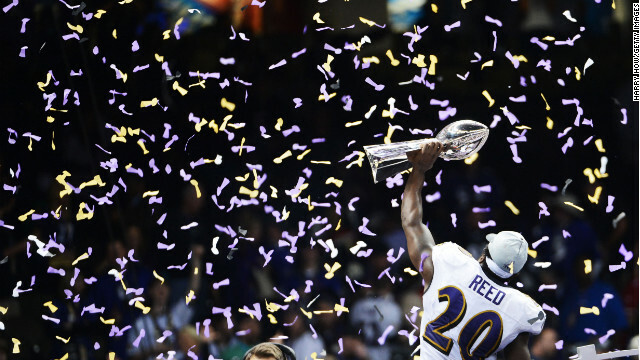 Ed Reed of the Baltimore Ravens hoists the Vince Lombardi Trophy after the win. 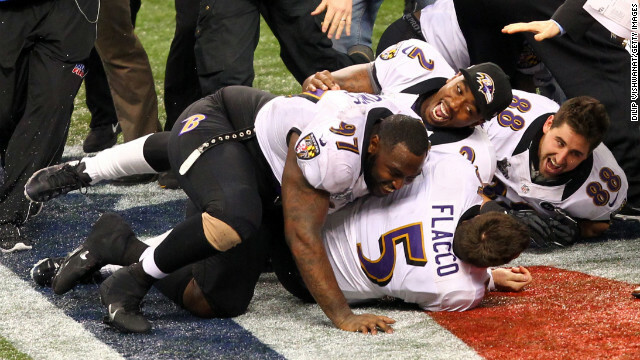 Quarterback Joe Flacco is tackled by teammates while celebrating after the game. 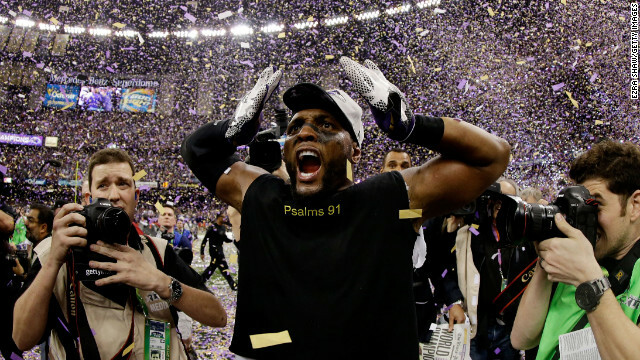 The Ravens' Ray Lewis celebrates his team's win. 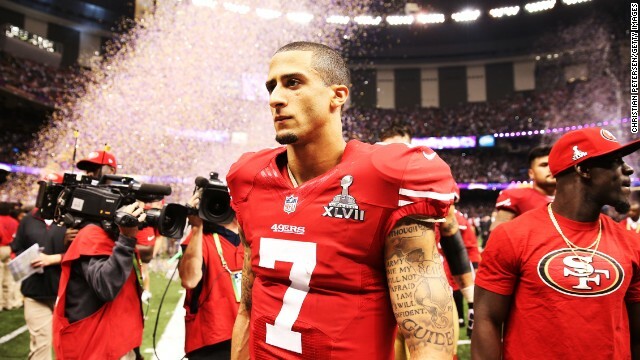 49ers quarterback Colin Kaepernick walks off the field after the game. 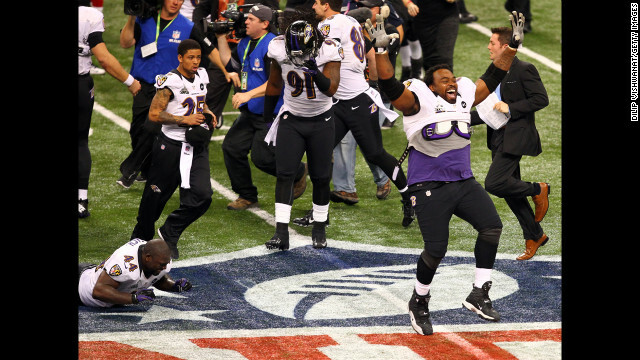 Bobbie Williams of the Baltimore Ravens, right, and his teammates celebrate their win against the San Francisco 49ers. 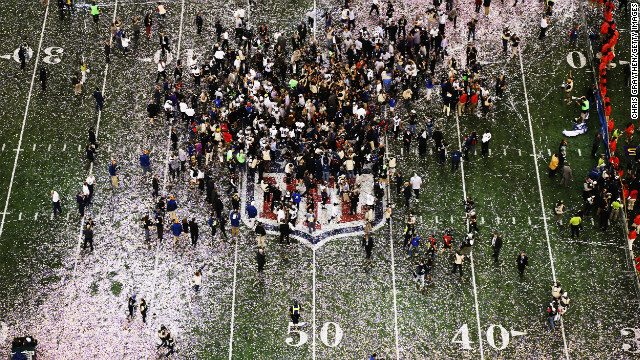 Confetti falls on the field as the Ravens celebrate their 34-31 victory over the 49ers. 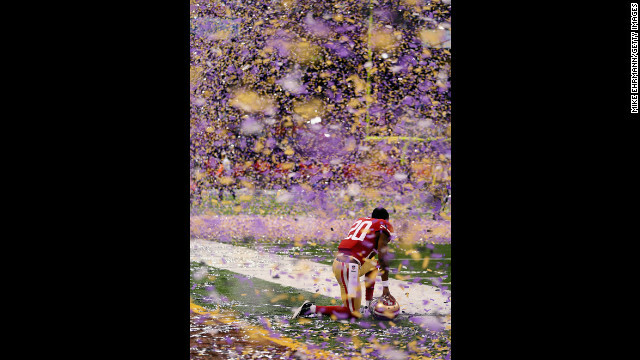 Cornerback Perrish Cox of the San Francisco 49ers kneels down among the confetti following his team's loss. 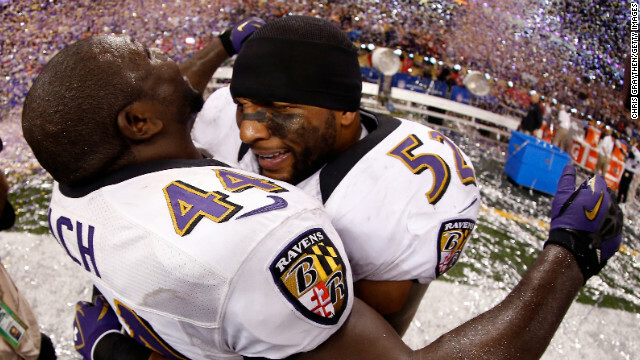 Vonta Leach, left, and Ray Lewis of the Baltimore Ravens celebrate on the field after the game. Michael Crabtree of the San Francisco 49ers fails to make a catch in the end zone late in the fourth quarter against Ed Reed of the Baltimore Ravens. 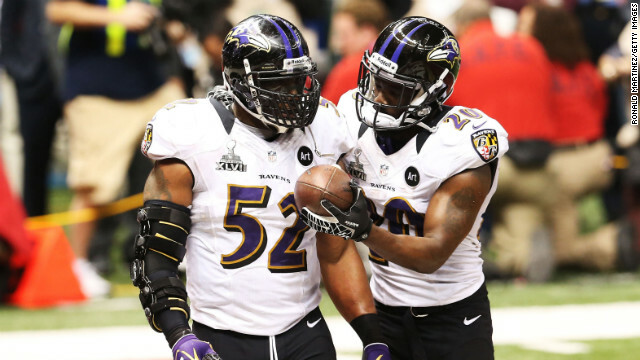 Ray Lewis, left, and Ed Reed of the Baltimore Ravens celebrate after the San Francisco 49ers couldn't convert on a fourth down play in the final two minutes of the fourth quarter. 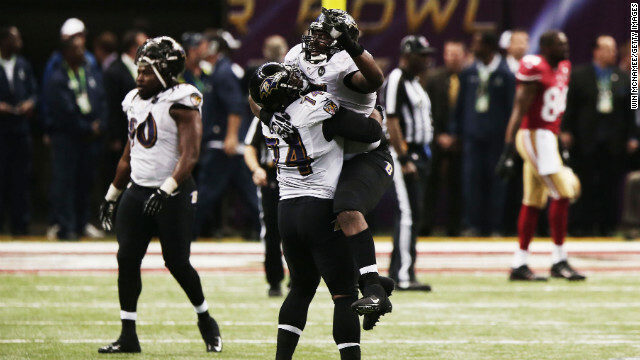 Michael Oher of the Ravens lifts teammate Arthur Jones into the air as the clock runs out. 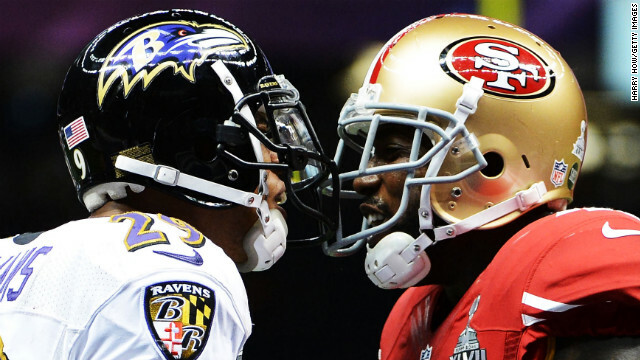 Patrick Willis of the San Francisco 49ers makes contact with Bernard Pierce of the Baltimore Ravens. 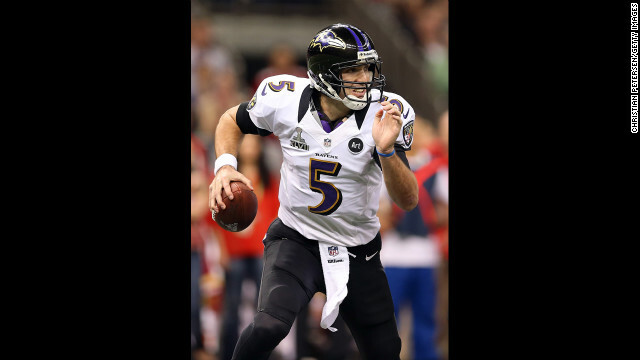 Joe Flacco of the Baltimore Ravens throws a pass in the fourth quarter against the San Francisco 49ers. 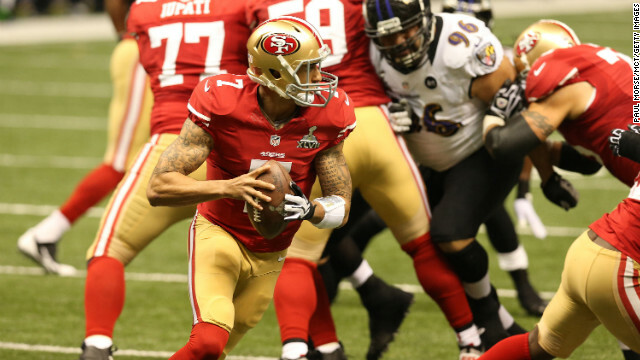 Quarterback Colin Kaepernick of the 49ers scores a 15-yard rushing touchdown in the fourth quarter against the Ravens. Anquan Boldin of the Baltimore Ravens stiff-arms Chris Culliver of the San Francisco 49ers after catching a 30-yard pass in the third quarter. 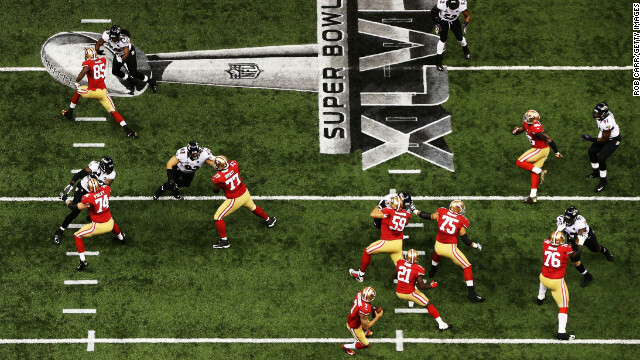 Ravens quarterback Joe Flacco throws a pass against the San Francisco 49ers during Super Bowl XLVII. 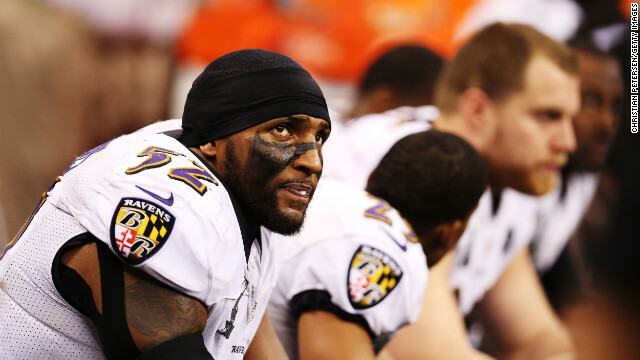 Ray Lewis of the Baltimore Ravens watches from the bench during the third quarter. 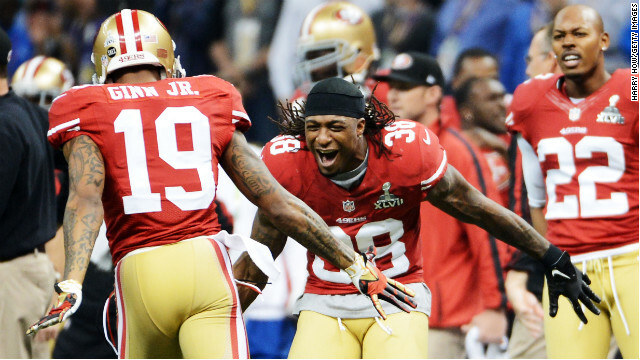 Ted Ginn Jr., left, of the San Francisco 49ers celebrates with teammate Dashon Goldson after a long punt return. 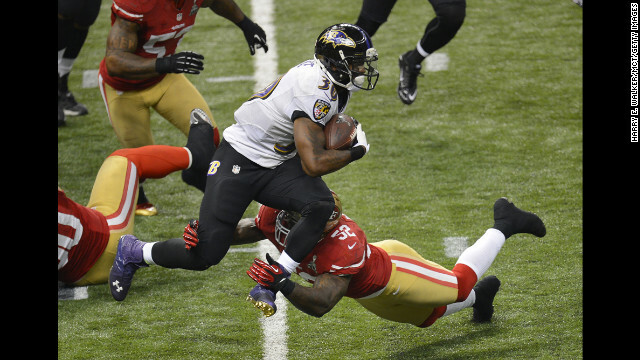 Bernard Pierce of the Baltimore Ravens is tackled by Dashon Goldson of the 49ers. 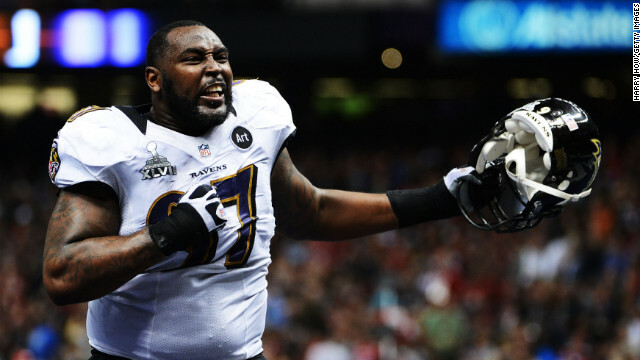 Arthur Jones of the Baltimore Ravens celebrates after a tackle during Super Bowl XLVII. 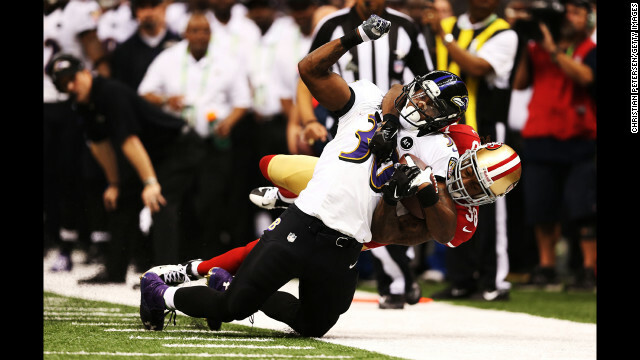 Tarell Brown of the San Francisco 49ers causes Ray Rice of the Baltimore Ravens to fumble in the third quarter; Brown recovered the fumble. 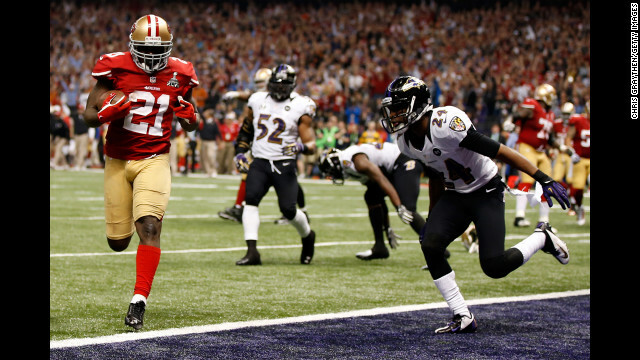 Frank Gore of the 49ers runs in for a touchdown in the third quarter past Corey Graham of the Ravens. 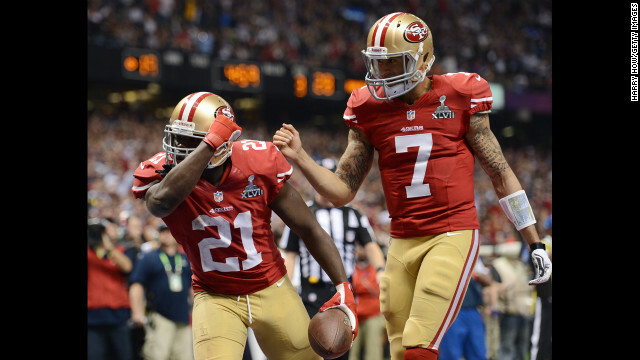 Frank Gore, left, and Colin Kaepernick of the 49ers celebrate after Gore scored a 6-yard rushing touchdown in the third quarter. 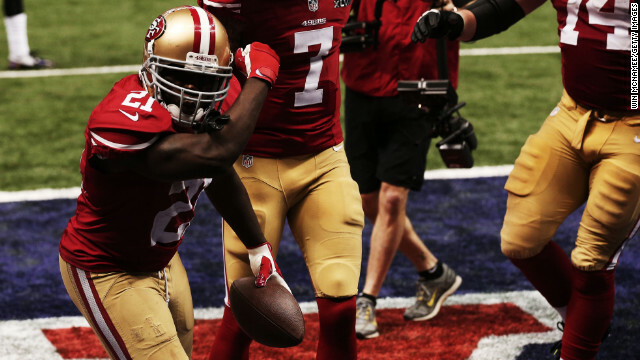 Running back Frank Gore of the San Francisco 49ers celebrates with quarterback Colin Kaepernick after scoring a touchdown in the third quarter. 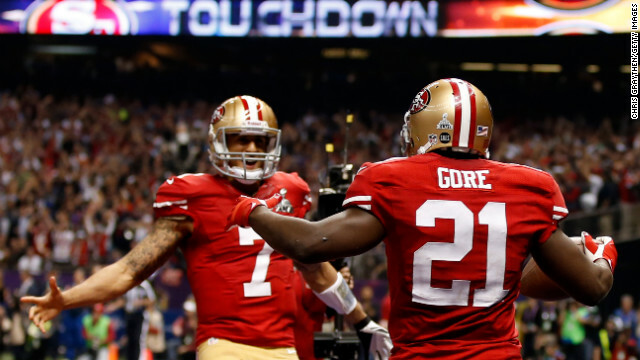 Frank Gore of the 49ers celebrates his 6-yard rushing touchdown in the third quarter. 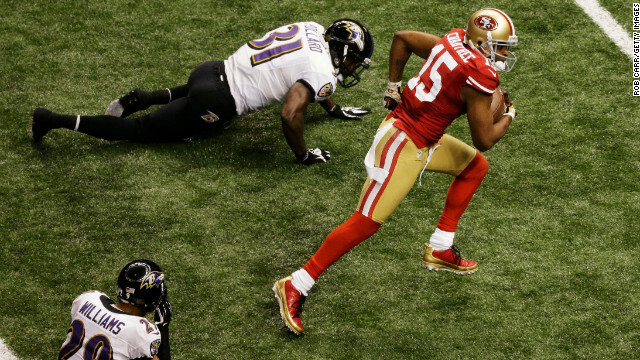 Michael Crabtree of the 49ers scores on a touchdown pass in the third quarter against the Baltimore Ravens. 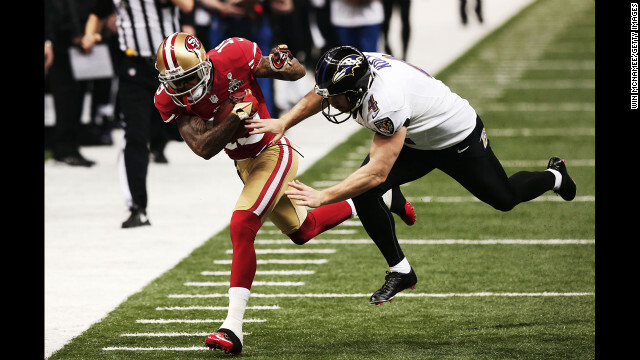 Ted Ginn Jr. of the 49ers returns a punt 32 yards against Sam Koch of the Ravens. 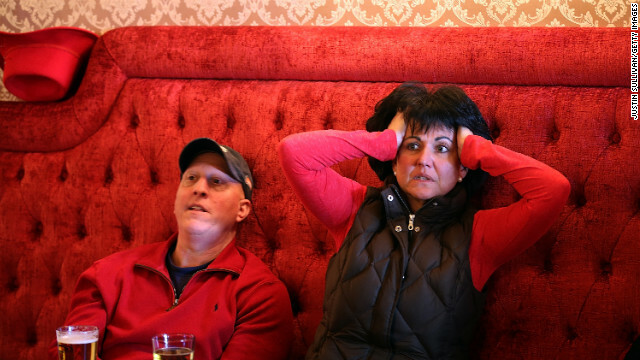 49er fans react as they watch Super Bowl XLVII at Gold Dust Lounge in San Francisco. Anquan Boldin of the Baltimore Ravens attempts to catch a pass in front of Chris Culliver, center, and Dashon Goldson of the San Francisco 49ers. 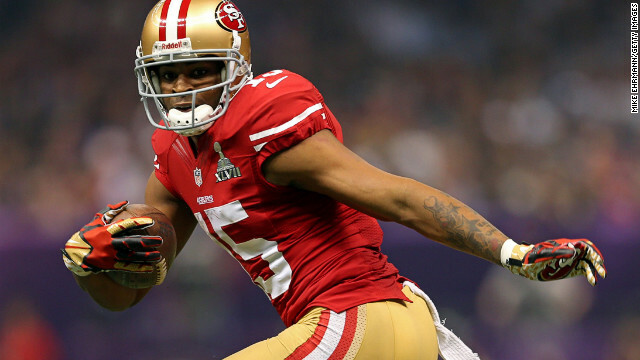 Michael Crabtree of the San Francisco 49ers runs into the end zone on a 31-yard touchdown reception in the third quarter. 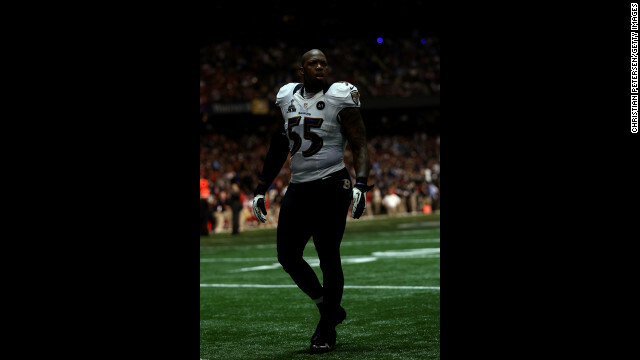 Terrell Suggs of the Baltimore Ravens paces on the field during the power outage. 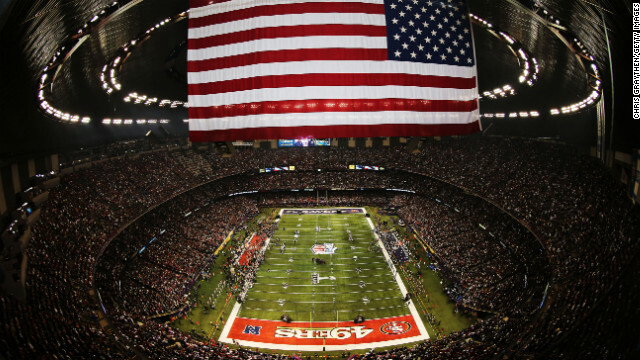 The San Francisco 49ers wait for all the power to come back to the Superdome. 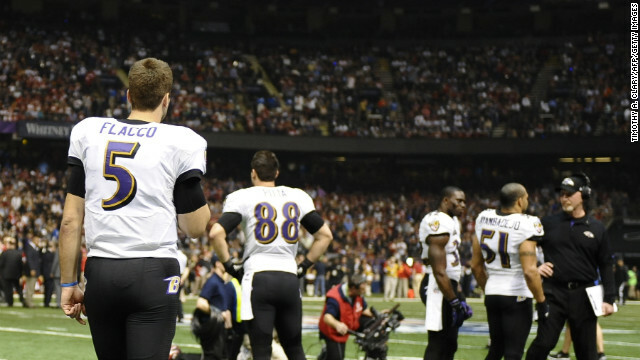 Quarterback Joe Flacco and Baltimore Ravens teammates wait on the field as a third-quarter power outage brings Super Bowl XLVII to a temporary halt. The Ravens' cheerleaders perform on the sidelines during the power outage. 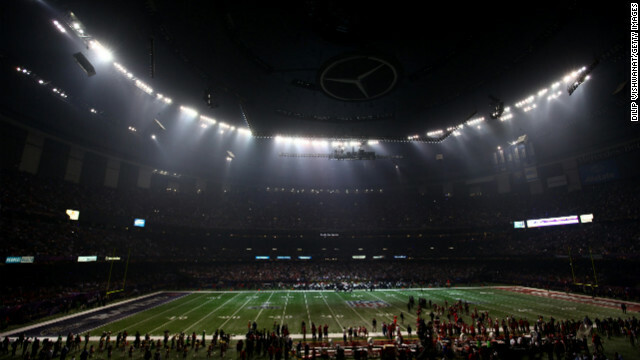 A sudden power outage at the Mercedes-Benz Superdome causes a 34-minute delay early in the third quarter. Jacoby Jones of the Baltimore Ravens, No. 12, does "the Ray Lewis dance" to celebrate his 108-yard kickoff return for a touchdown at the start of the third quarter. 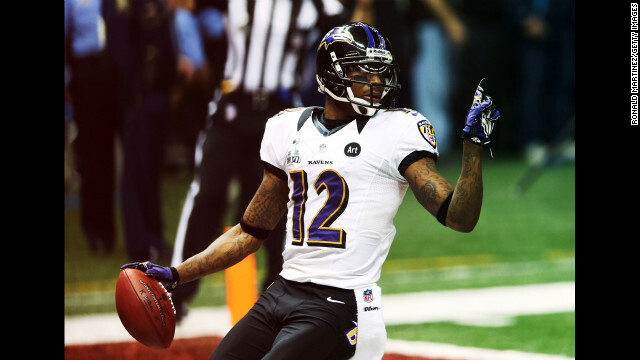 Ravens kick returner Jacoby Jones celebrates his touchdown at the start of the second half. 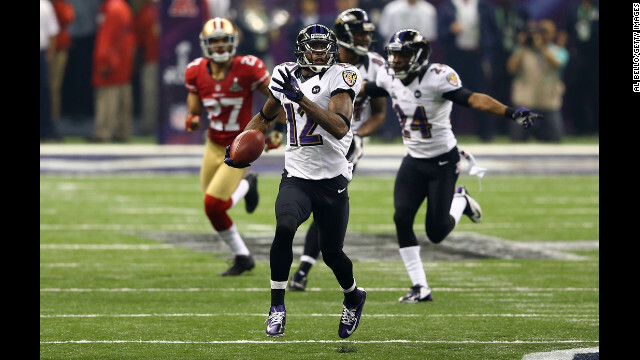 Jacoby Jones of the Baltimore Ravens runs the second-half kickoff back 108 yards for a touchdown. 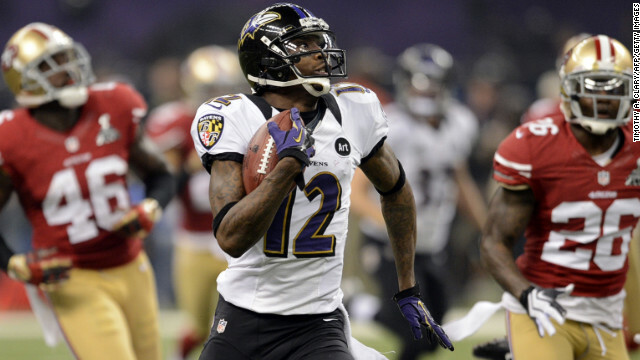 Jacoby Jones of the Baltimore Ravens returns the second-half kickoff 108 yards for a record-tying touchdown. 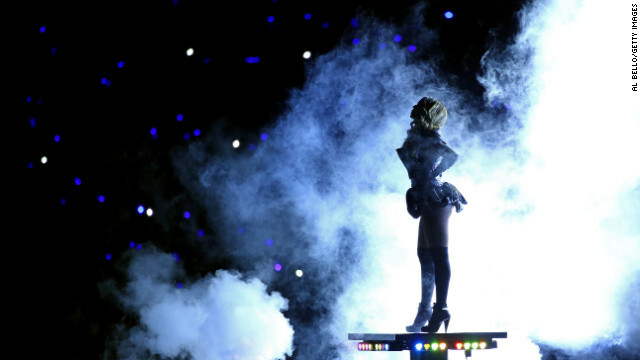 Pop singer Beyonce performs during the Pepsi Super Bowl XLVII Halftime Show. Beyonce sings during her halftime performance. Beyonce greets fans during the halftime show. Beyonce lies on stage while performing Sunday night. Beyonce appears on a rising platform during the halftime show. Beyonce dances in front of a screen on stage. 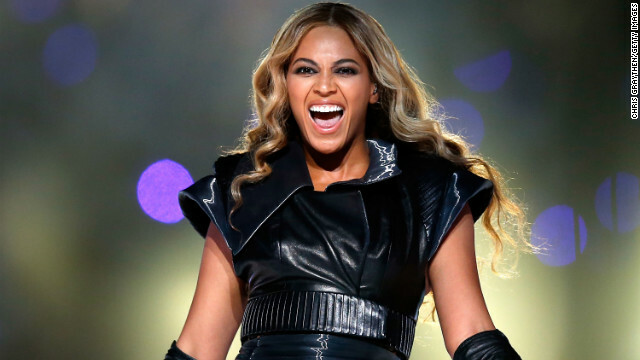 Beyonce performs a medley of her hits at halftime on Sunday. 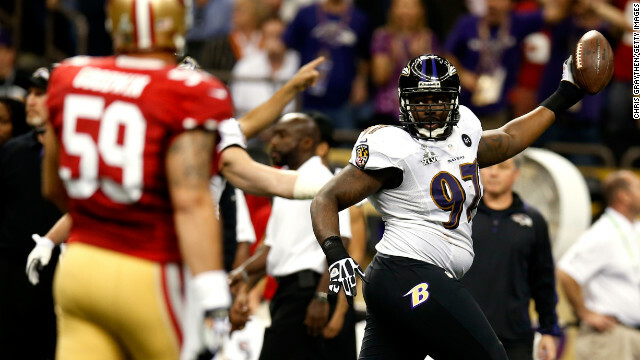 Arthur Jones of the Baltimore Ravens exults as he walks off of the field at halftime. 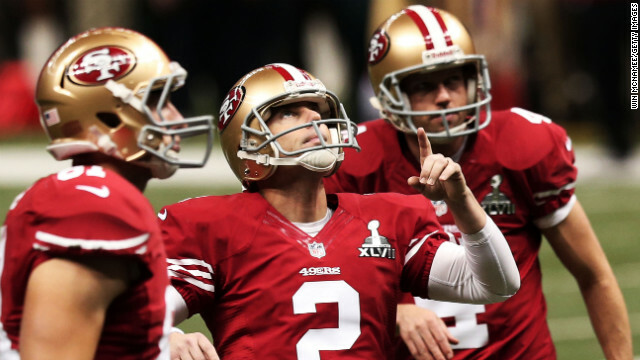 49ers kicker David Akers celebrates after kicking a 27-yard field goal in the second quarter. 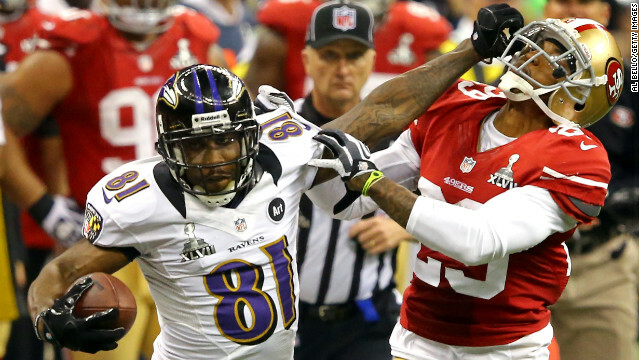 Cary Williams of the Ravens exchanges words with Delanie Walker of the 49ers. 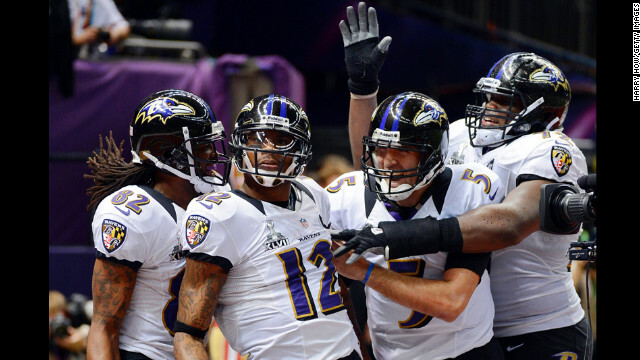 From left, Torrey Smith, Jacoby Jones, Joe Flacco and Kelechi Osemele of the Baltimore Ravens celebrate after Jones scored on a 56-yard touchdown pass from Flacco. 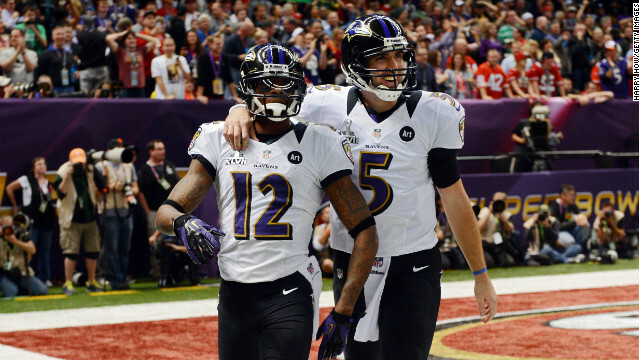 Jacoby Jones, left, and Joe Flacco of the Baltimore Ravens celebrate after their second-quarter touchdown. 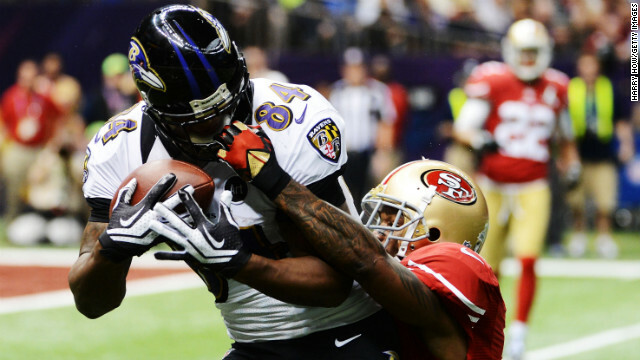 Ravens wide receiver Jacoby Jones catches the ball before running it in for a touchdown against Chris Culliver of the 49ers. 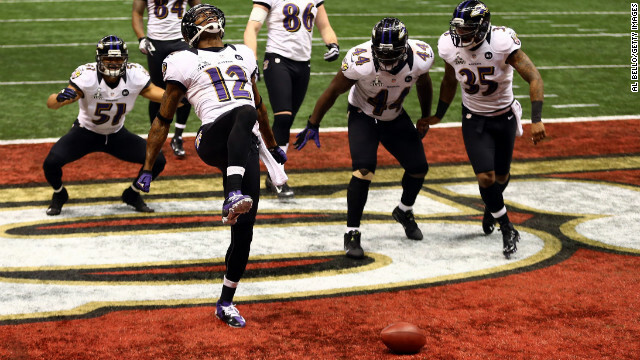 Jacoby Jones of the Ravens catches a 56-yard pass. He would get up and score. 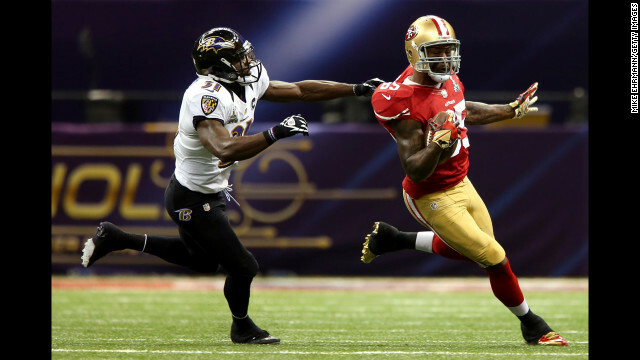 Jacoby Jones of the Ravens runs on a 56-yard touchdown pass past Chris Culliver of the San Francisco 49ers. 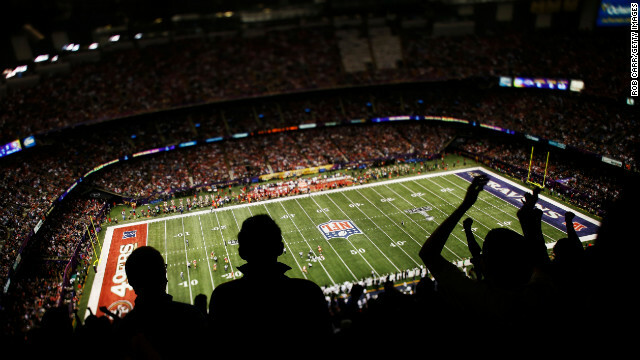 Fans cheer in the cavernouse Mercedes-Benz Superdome in New Orleans during Super Bowl XLVII. 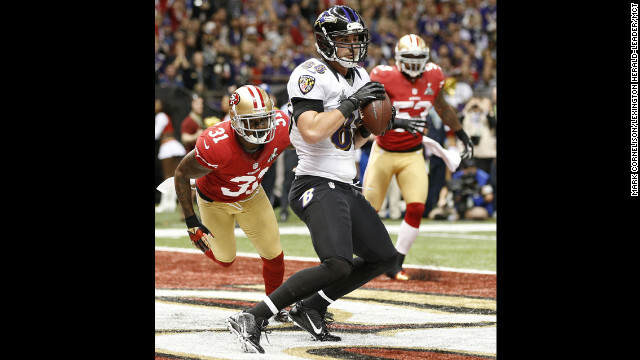 Dennis Pitta of the Baltimore Ravens pulls in a 1-yard touchdown pass in the second quarter. Ed Dickson of the Baltimore Ravens is brought down by Donte Whitner of the San Francisco 49ers. Kicker Justin Tucker of the Baltimore Ravens is stopped short of a first down on a fake field goal attempt in the second quarter. Patrick Willis is the tackler. 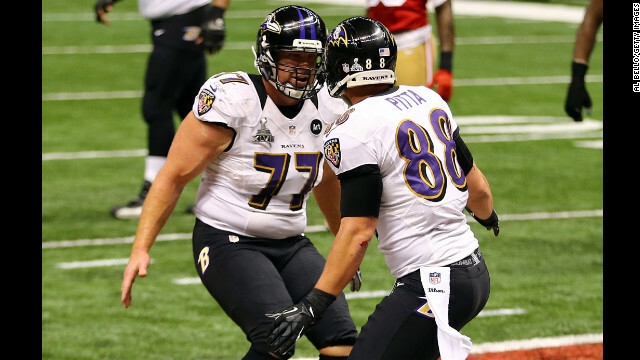 Dennis Pitta of the Baltimore Ravens, right, celebrates with teammate Matt Birk after catching a touchdown pass in the second quarter. 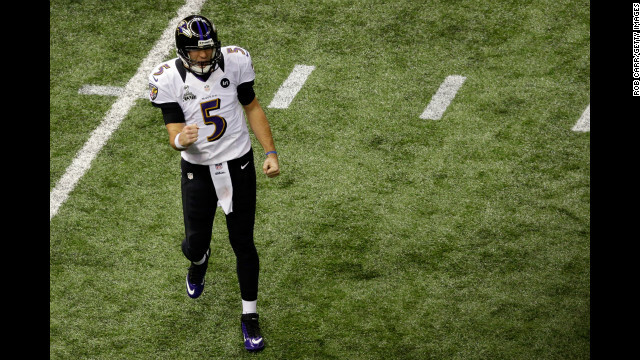 Ravens quarterback Joe Flacco celebrates after throwing a 1-yard touchdown pass to Dennis Pitta. 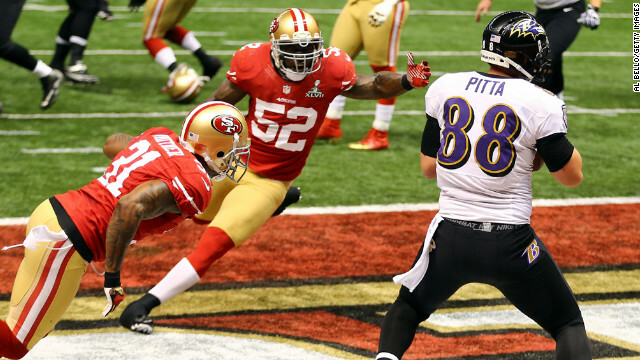 Dennis Pitta of the Baltimore Ravens catches a touchdown pass in front of Donte Whitner, left, and Patrick Willis of the San Francisco 49ers. 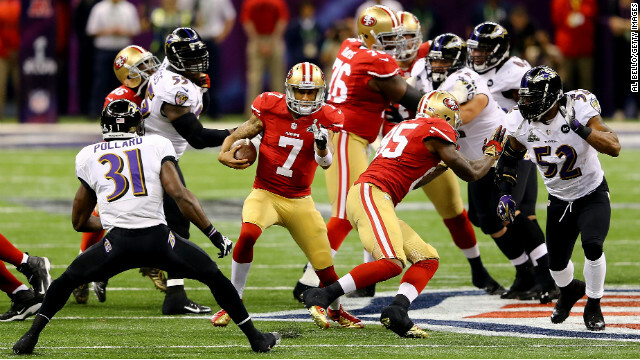 Quarterback Colin Kaepernick of the San Francisco 49ers rolls out of the pocket against the Ravens. 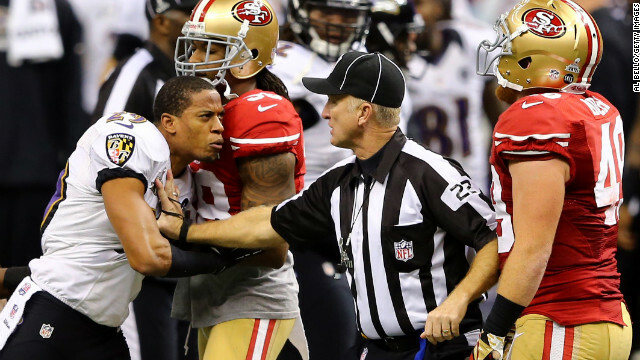 Baltimore Ravens cornerback Cary Williams reacts angrily after a play as head linesman Steve Stelljes and 49ers fullback Bruce Miller attempt to hold him back. 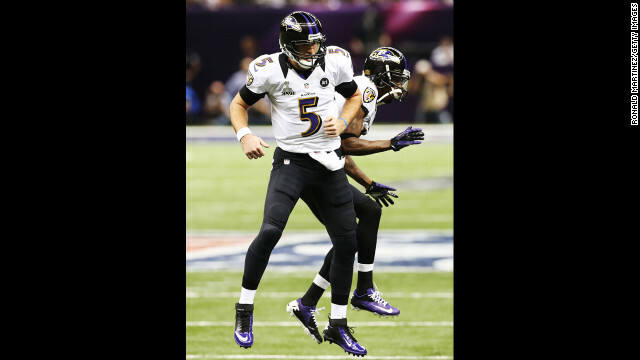 Joe Flacco, left, and Jacoby Jones of the Baltimore Ravens celebrate after Flacco threw a 1-yard touchdown pass to Dennis Pitta. Donte Whitner of the San Francisco 49ers commits a face mask penalty against Ed Dickson of the Baltimore Ravens in the second quarter. 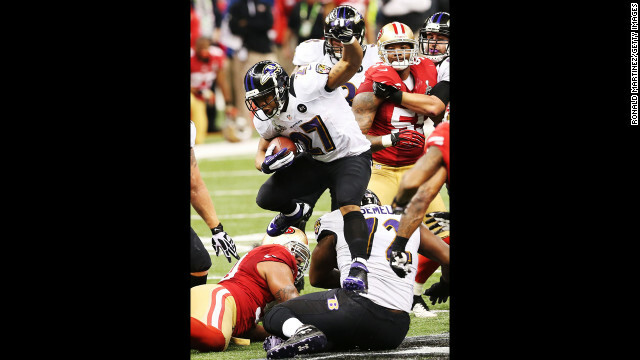 Ray Rice of the Baltimore Ravens runs the ball against the 49ers. 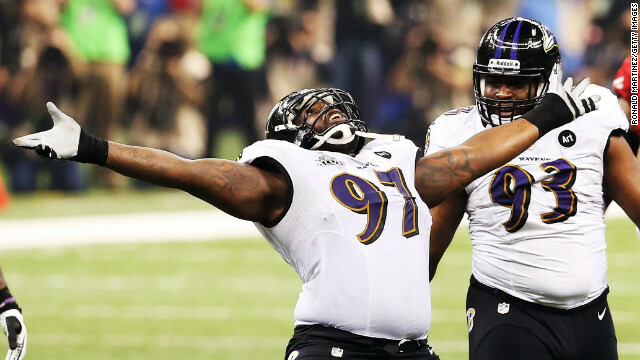 Arthur Jones of the Baltimore Ravens celebrates after recovering a fumble from LaMichael James of the San Francisco 49ers in the second quarter of Super Bowl XLVII. 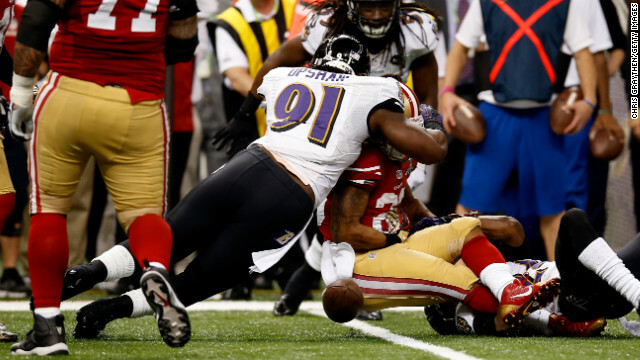 Courtney Upshaw of the Ravens forces LaMichael James of the 49ers to fumble in the second quarter. 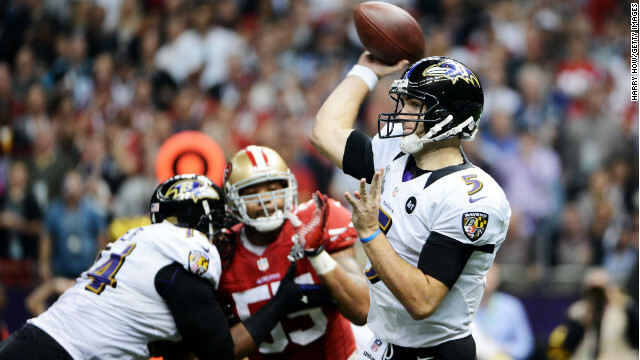 Quarterback Joe Flacco of the Ravens attempts to escape pressure from Ahmad Brooks of the 49ers. 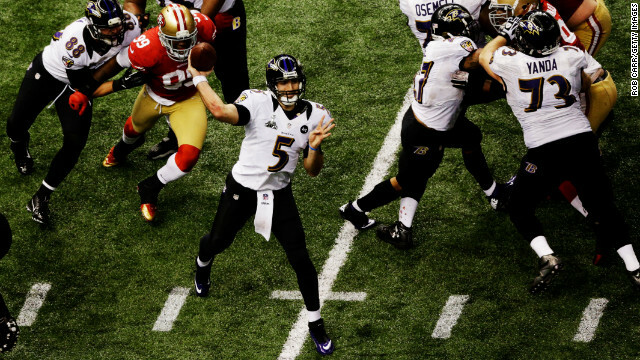 Ravens quarterback Joe Flacco scrambles out of the pocket against the 49ers. 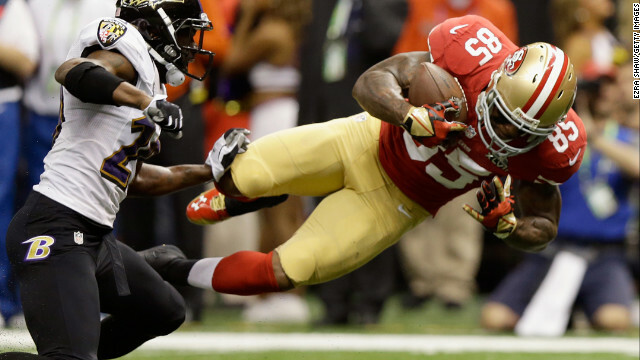 Bernard Pollard of the Baltimore Ravens tries to tackle Vernon Davis of the San Francisco 49ers. 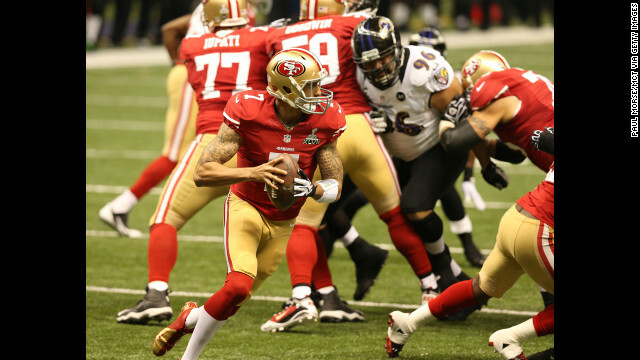 Quarterback Colin Kaepernick of the 49ers rolls out of the pocket and looks to pass during the second quarter. Vernon Davis of the San Francisco 49ers goes airborne after catching a pass against the Baltimore Ravens in the first quarter of Super Bowl XLVII at the Mercedes-Benz Superdome in New Orleans, Louisiana, on Sunday, February 3. David Akers of the San Francisco 49ers kicks a 36-yard field goal in the first quarter. 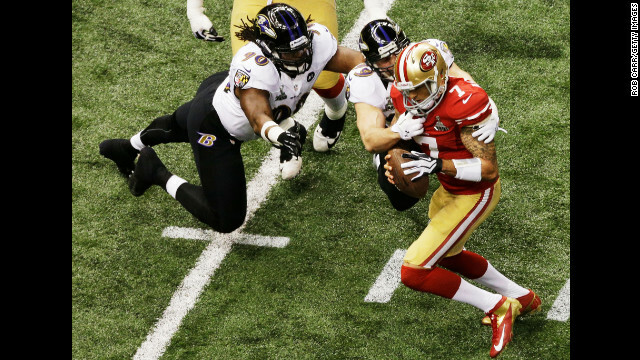 Paul Kruger of the Baltimore Ravens sacks 49ers quarterback Colin Kaepernick. 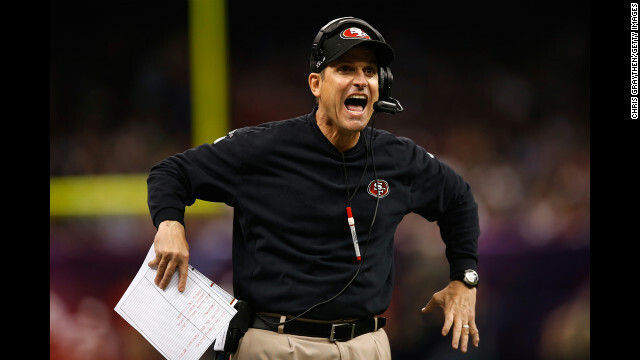 49ers head coach Jim Harbaugh reacts to a play in the first quarter. 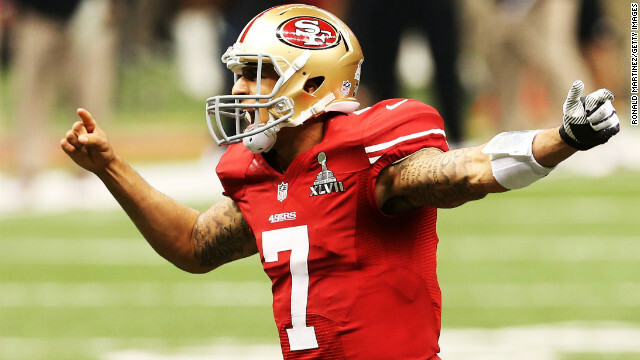 49ers quarterback Colin Kaepernick directs his teammates before a snap in the first quarter. 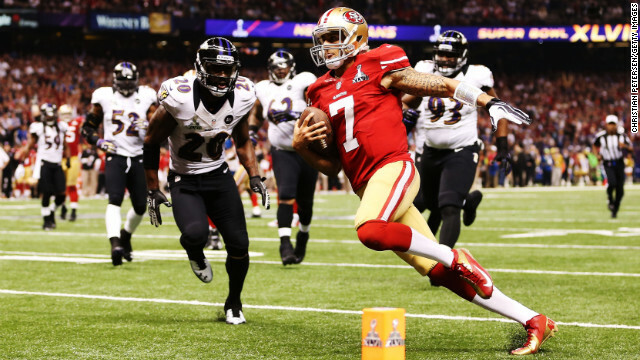 Quarterback Colin Kaepernick of the 49ers runs with the ball in front of Ravens safety Bernard Pollard, No. 31. 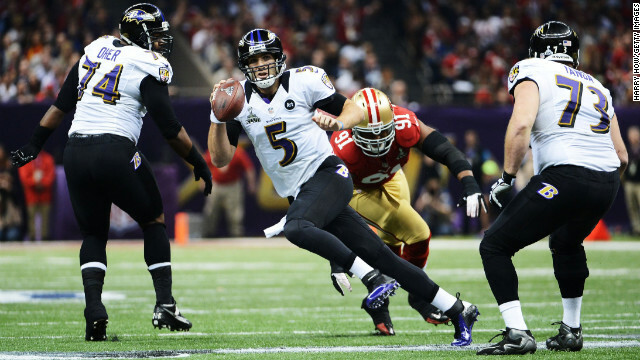 Ravens quarterback Joe Flacco scrambles with the ball against 49ers defensive end Ray McDonald. 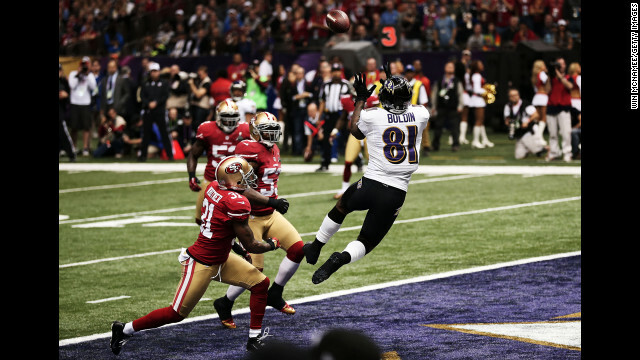 Anquan Boldin of the Baltimore Ravens makes a 13-yard touchdown reception in the first quarter against the San Francisco 49ers during Super Bowl XLVII at the Mercedes-Benz Superdome on Sunday, February 3, in New Orleans, Louisiana. 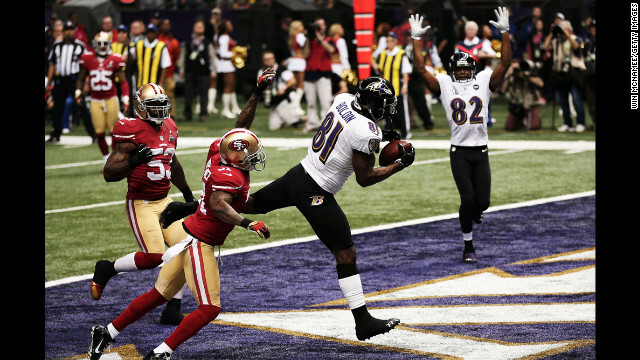 Ravens wide receiver Anquan Boldin brings the ball down in the end zone. 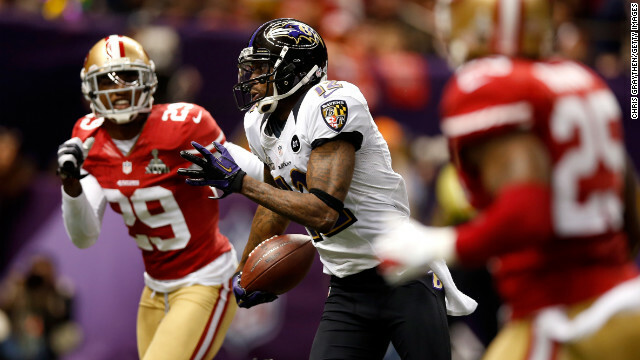 Donte Whitner of the 49ers tries to defend Anquan Boldin of the Ravens. Quarterback Colin Kaepernick of the San Francisco 49ers drops back to pass in the first quarter against the Baltimore Ravens. 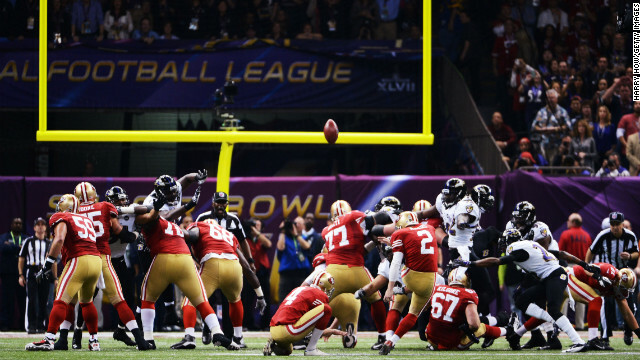 Justin Tucker of the Baltimore Ravens kicks the ball to the San Francisco 49ers to start Super Bowl XLVII. 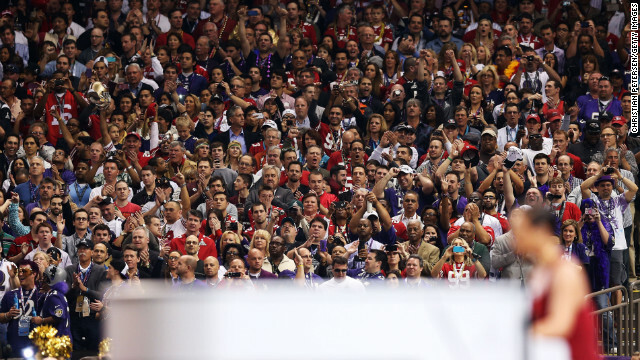 Alicia Keys sings the National Anthem before the start of Super Bowl XLVII. 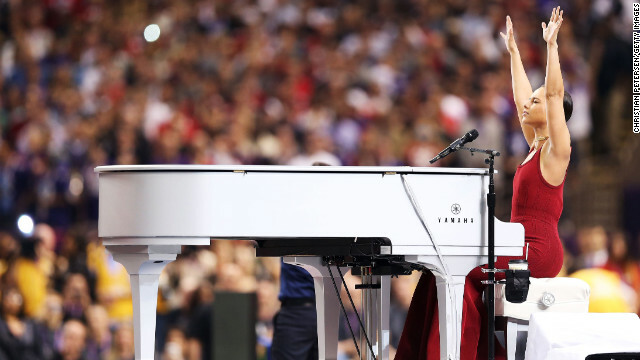 Alicia Keys reaches into the air during her rendition of the National Anthem. 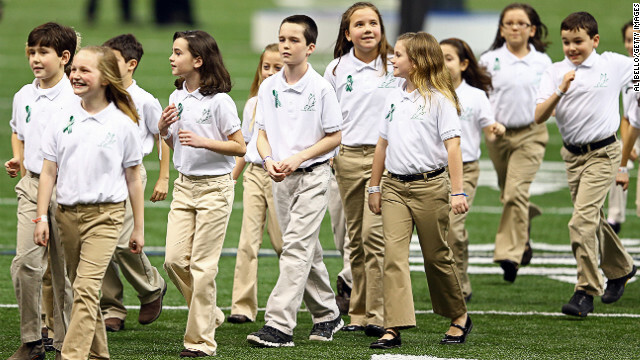 Children in the Sandy Hook Elementary School Chorus walk off the field after singing "America The Beautiful" prior to Super Bowl XLVII. 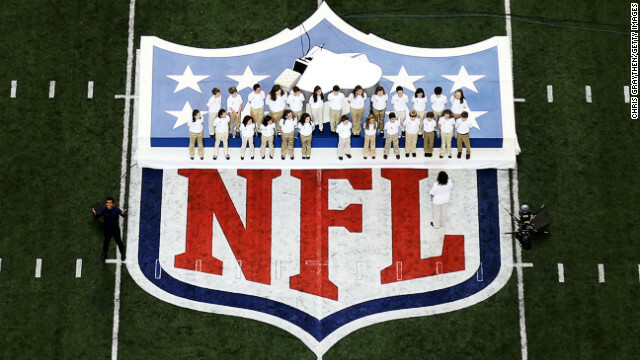 The Sandy Hook Elementary School Chorus stands on the field for their performance of "America the Beautiful." 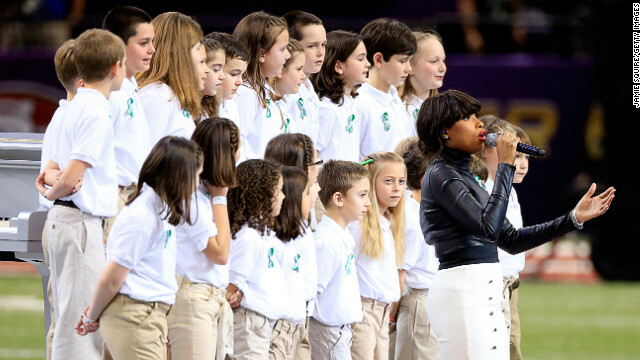 Singer Jennifer Hudson performs "America The Beautiful" with the Sandy Hook Elementary School Chorus. The American flag hangs above the field as Jennifer Hudson performs "America the Beautiful" with the Sandy Hook Elementary School Chorus. 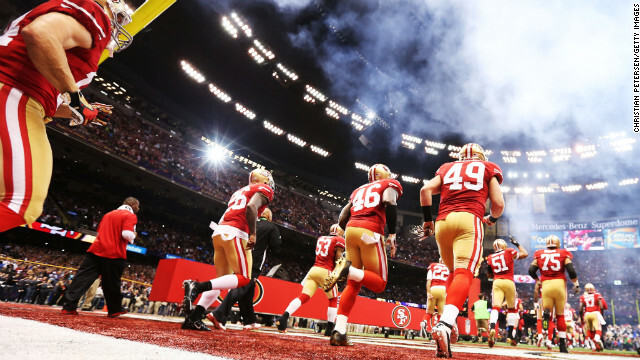 The San Francisco 49ers take the field. 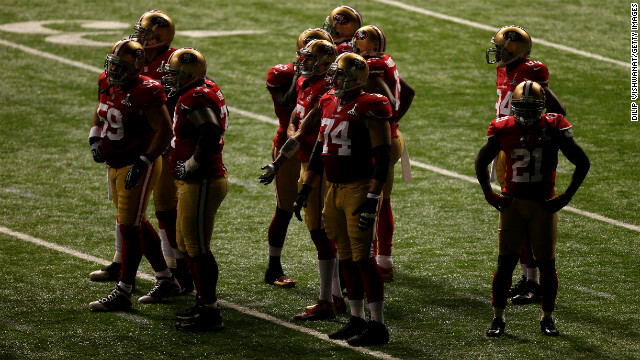 The 49ers huddle up prior to the start of the game. 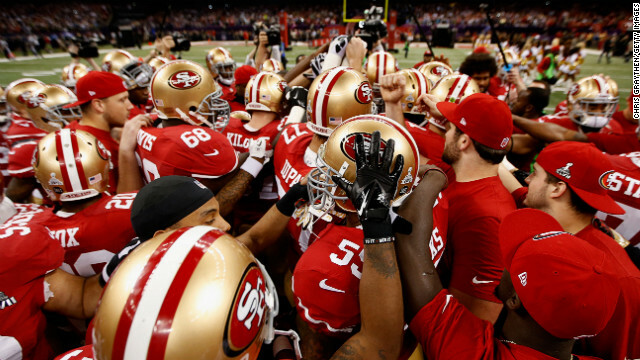 The 49ers huddle on the field prior to taking on the Baltimore Ravens in Super Bowl XLVII. C.J. 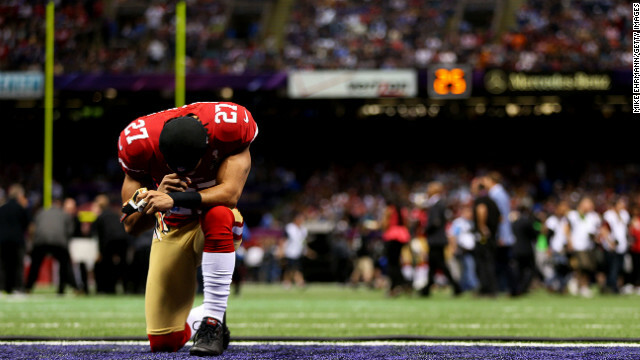 Spillman of the San Francisco 49ers kneels in the endzone prior to the start of Super Bowl XLVII against the Baltimore Ravens. San Francisco 49ers cheerleaders get ready take the field ahead of the game against the Baltimore Ravens. 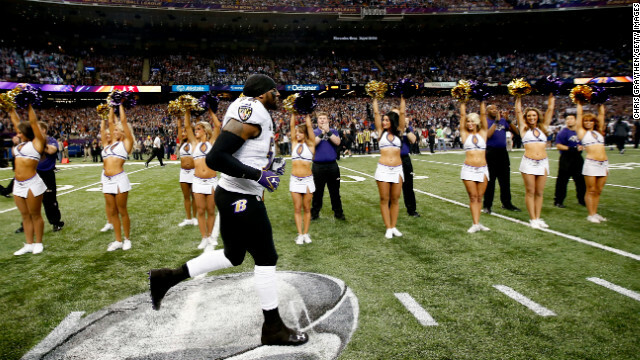 Veteran Baltimore Ravens linebacker Ray Lewis runs onto the field as cheerleaders and fans cheer. 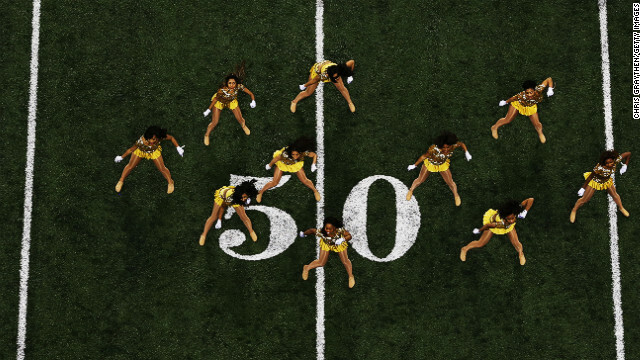 Dancers perform on the field before the start of Super Bowl XLVII. 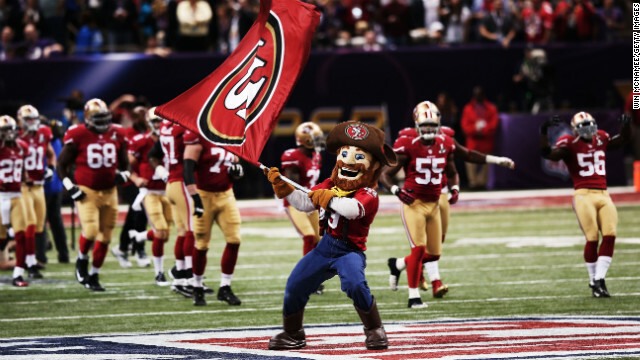 49ers mascot Sourdough Sam waves a flag on the field as players take the field shortly before kickoff. 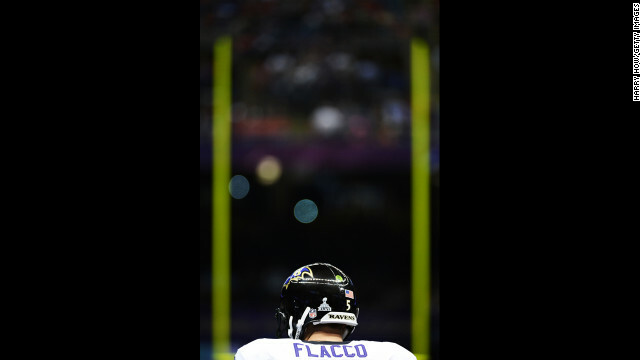 Quarterback Joe Flacco of the Baltimore Ravens stands on the field prior to kickoff against the San Francisco 49ers. Ravens cheerleaders stand on the sidelines before Sunday night's game against the 49ers. 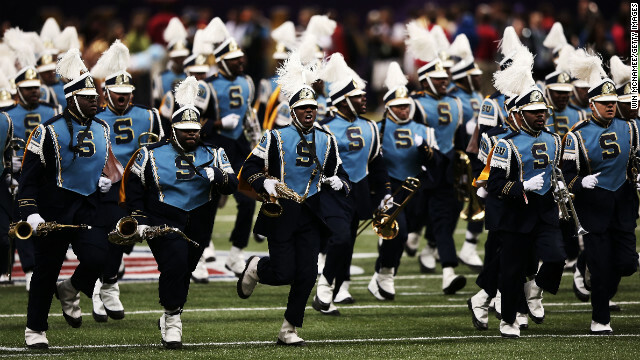 The Southern University Marching Band gets ready to perform before the start of Super Bowl XLVII. 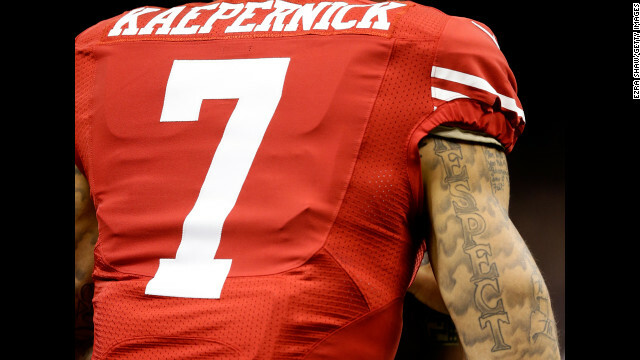 Quarterback Colin Kaepernick of the San Francisco 49ers warms up on the field prior to the Super Bowl. 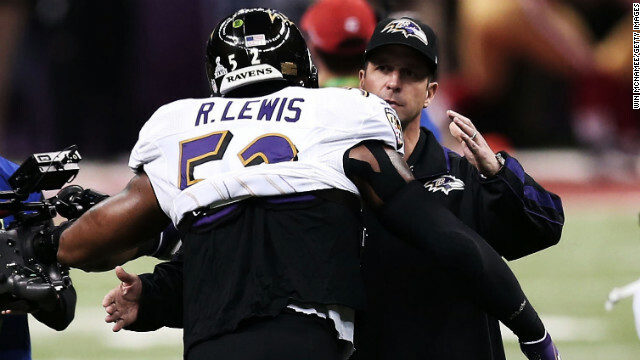 Head coach John Harbaugh of the Baltimore Ravens hugs linebacker Ray Lewis prior to the start of Super Bowl XLVII against the San Francisco 49ers. 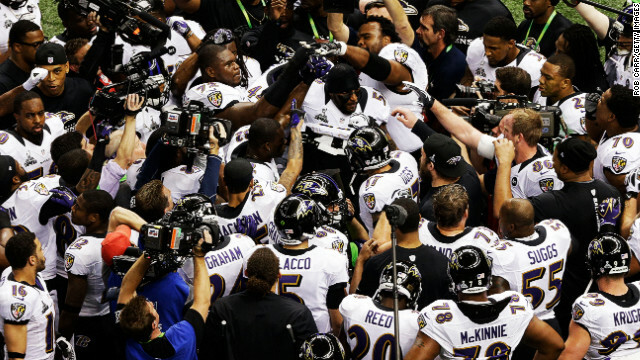 Baltimore Ravens players gather around team leader Ray Lewis as he leads them in a rally on the field just before the start of the game. 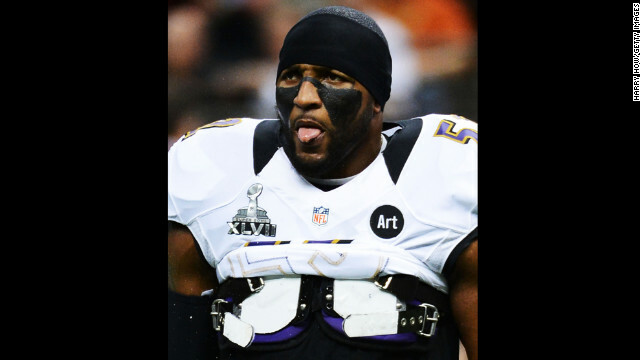 Ray Lewis of the Baltimore Ravens warms up on field before the start of Super Bowl XLVII against the San Francisco 49ers. 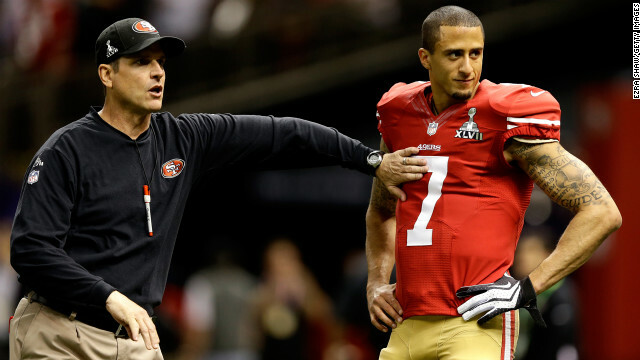 Head coach Jim Harbaugh works with quarterback Colin Kaepernick of the San Francisco 49ers during warm-ups prior to the game. 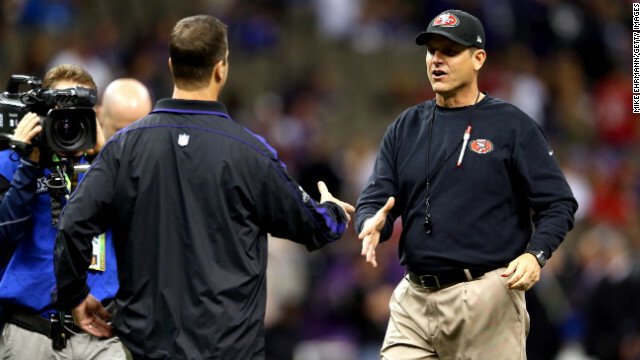 Head coach Jim Harbaugh, right, of the San Francisco 49ers shakes hands with his brother, head coach John Harbaugh of the Baltimore Ravens, prior to the start of Super Bowl XLVII. 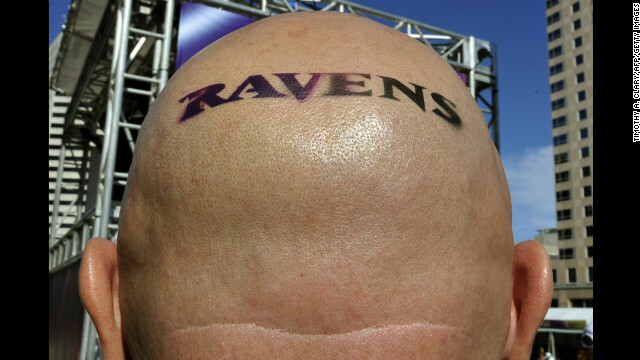 A Baltimore Ravens fan wears his heart on his scalp in New Orleans. O.J. Brigance, left, senior player development adviser for the Baltimore Ravens, makes his way across the field with his wife, Chanda, prior to the start of Super Bowl XLVII. 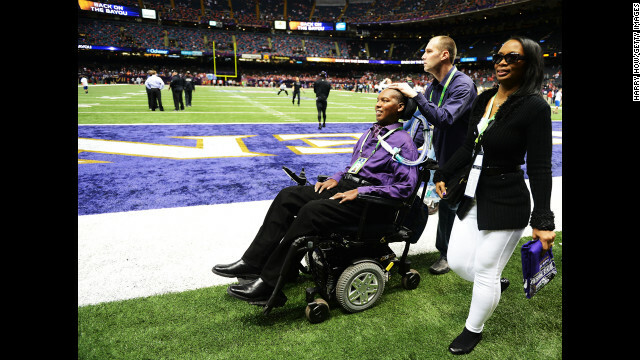 Brigance, a former Ravens player, was diagnosed with Lou Gehrig's disease in 2007. 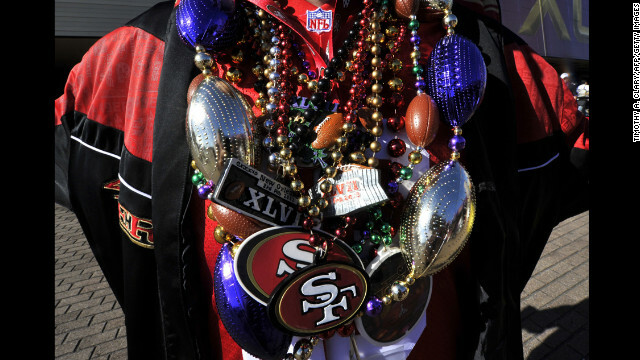 A 49ers fan is weighed down with team paraphernalia poses outside the Superdome before the start of the game. 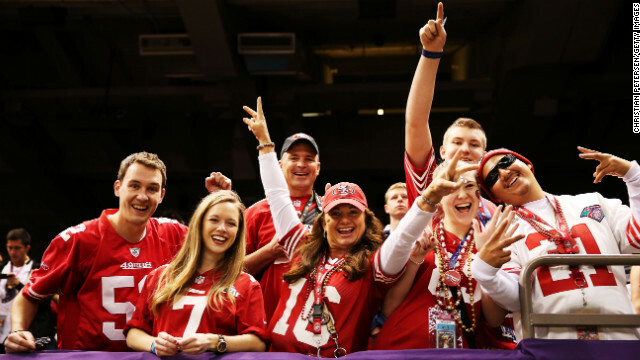 49ers fans cheer for their team from the stands during pre-game warm-ups. 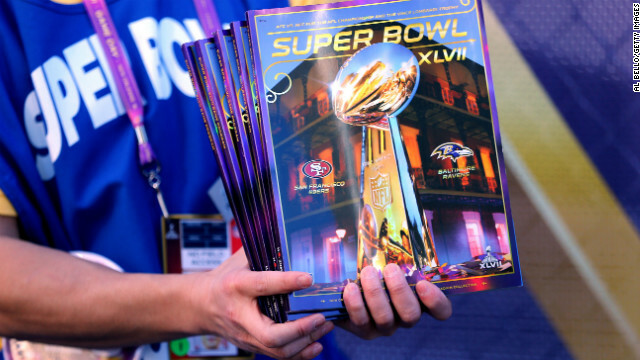 Super Bowl programs are sold outside the stadium as fans stream into the Superdome. 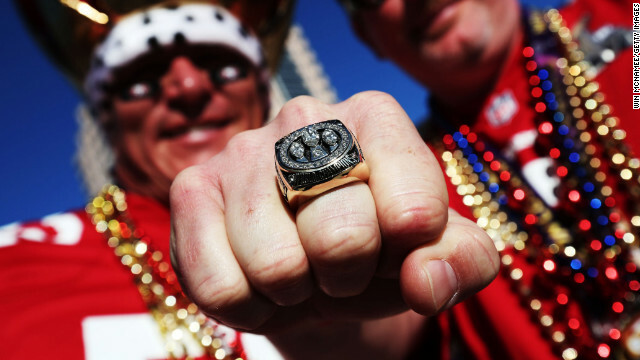 San Francisco fans Shane Knight, left, and Jimmy Bowers are hoping the 49ers earn another ring. (CNN) -- Between the bad commercials, Beyonce's halftime gig, the Harbaugh brothers and the action on the field, the jokesters of Twitter had plenty to snicker about during Sunday's Super Bowl. 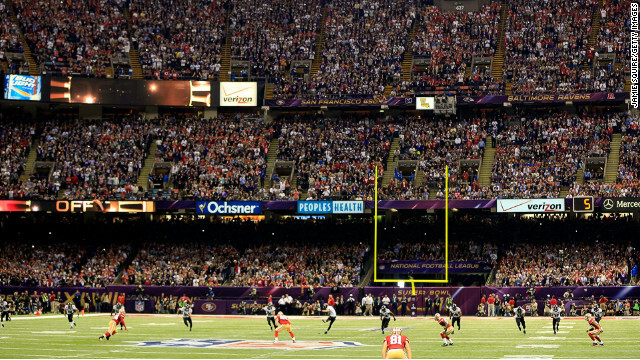 But then the lights went out in the Superdome, and Twitter really heated up. The year's most-watched sporting event, interrupted by a 35-minute delay in the third quarter, may forever be known as the #Blackout Bowl. 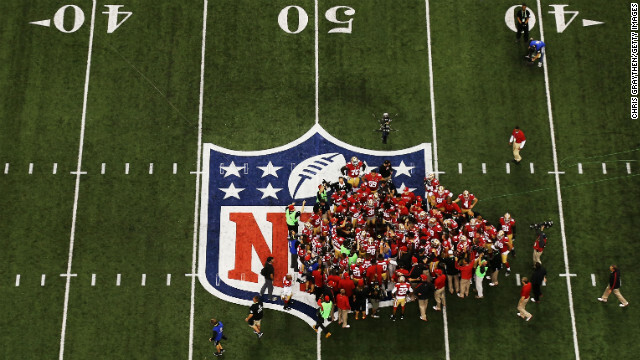 The bizarre interlude seemed to energize the San Francisco 49ers and the Twitterverse, which until then had been complaining about the one-sided game. Twitter said its volume of chatter spiked during the blackout, reaching 231,500 tweets per minute. In total, there were 24.1 million tweets posted about the game and its halftime show, said Twitter in a blog post. By the beginning of the second half, Twitter said its volume of tweets had already surpassed last year's total for the whole game. James Burnett ‏-- The guy refereeing Puppy Bowl IX must be thinking, "I did not get into broadcasting to call 'poopy penalty!' with a straight face." Joshua Topolsky -- So annoying the way this game keeps interrupting the commercials. Why is everybody so upset with VW for making fun of a Jar Jar Binks accent? Athena ‏-- ‪#nodaddy ‪#superbowl I don't know what to do with that go daddy commercial. I think I need therapy. Doug and Polly White -- Our 6 yr old granddaughter just asked if the players in black were the raisins ‪#superbowl47" lol! Ed Bott -- This is the best episode of The Wire, ever. Greg Miller ‏‪-- They just teleported the rest of Destiny's Child to the ‪#SuperBowl from the alternate dimension Beyonce trapped them in. Robert Hernandez ‏‪-- Did Bane just take over the ‪#SuperBowl or something?! Men's Humor ‏-- Is this the ‪#Superbowl or a Buffalo Wild Wings commercial? Katie Mack ‏‪-- So now Daniel Craig comes over in a helicopter and the Queen parachutes down to fix the lights... wait, no, wrong event. Nick Toplass ‏‪-- In hindsight, maybe installing The Clapper was a bad idea. Joe Randazzo ‏‪-- Guys I'm AT the ‪#SuperBowl and this power outage is no joke. Most of us have broken into small but loyal factions. I am now a doctor. Will Ferrell ‏‪‏‪(parody account) -- This time, it's the rich people trapped in the Superdome. ‪#superbowl47"
Harry Knowles -- EDGAR ALLAN POE has a Super Bowl Win! Yes! Jocks never belittle the poet in your school again! CNN's Doug Gross also contributed to this story.